With the current economic climate, selling your home is now a difficult process and you and your agents need to do all you can to ensure your home is in the best possible shape to sell. 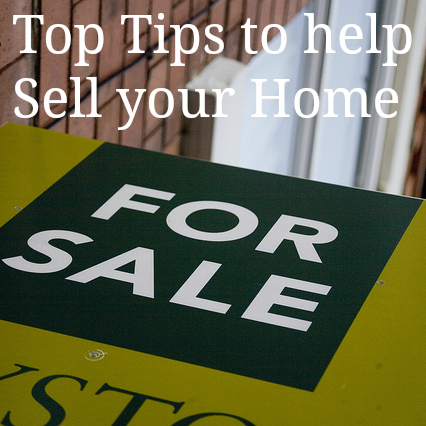 There is a lot you can do to make sure your home is attractive to buyers and I’ve come up with 5 top tips for getting your home ready to sell. I know we talk about decluttering a lot on the blog, about tidying our homes, finding the right storage and sifting through our old possessions to keep the clutter at bay. If you’re selling your home though this is one of the most important times to ensure you’ve decluttered to the maximum. Buyers need to come into a home and envisage themselves living there. If the house is full of bits and bobs scattered everywhere it makes it very difficult for the buyer to do this. Be ruthless. If you’re moving you don’t want to have to pack up years’ worth of old possessions so now’s the perfect time to sort through it all. Sell it on Ebay, have a yard sale, or take it to the charity shop, however you choose to get rid of it, you and your home will feel better for it. If you’re looking for tips on the best way to declutter, Oyster and Pearl has some great ideas here. I have to admit, I’d hate this bit of selling my home. The idea is you take out as much personal stuff as you can to help the potential buyer envision it as their home, and not yours. I think you’ve really got to be in the right place to be ready to do this; you really have to have accepted that you’re moving on. And when you have, take down and remove as many personal photos and memorabilia as you can from every room. Take every piece that is you and your family, that symbolises you all and remove it. As hard as it may seem it will help you sell your home! Well this one is common sense isn’t it? Go through each room, and the outside of your home and make a list of all the repair jobs that need doing. In addition to this, look at your decor and identify if there are any glaring revamp jobs that need doing. Then prioritise. You may get away with not having to do them all. Put yourself in your viewer’s shoes, and think what kind of jobs and repairs you’d be prepared to tackle for the asking price. It’s a good way of deciding which of the jobs absolutely have to be completed and which you could work around. If the roof needs a repair, or you have cracks, or windows need replacing, then you probably need to sort them out before putting your home on the market. Make sure your kitchen and bathroom are in good condition too. Buyers always imagine the worst when these areas appear unloved. A quick makeover costing a few hundred pounds could save you a fortune when it comes to haggling over the asking price. So what do I mean by re-purposing? Well, take a look at all the rooms in your home and ask yourself if they are used to their best potential. Is it clear to outsiders what the purpose of a room really is? Do you give mixed messages on how best to use a room? If you find this is case, then do think about how best you can juggle furniture and accessories to give the room a real sense of being. Turn a multi purpose dining/play/study room into just one thing – make it a proper dining room for example, centre your table and make it clear to buyers how they would be able to use the space. This is a probably a trick we miss out on on a lot, but it can really help you make the sale. Finally think about setting up your home ready for viewers so that they understand it’s a well kept, well looked after home. Set the dining table ready for dinner, plump the cushions and have soft music playing, make some coffee and buy some fresh flowers. All these little tricks may seem superficial but they really do work. Make sure you’ve done all this for the photos too of course, so your house can be marketed to its full potential. Once you’ve gone to all this hard work, don’t just sit back and wait for the potential buyers to come streaming through your front door. Be proactive, get your agent doing his or her bit, but do yours as well. Get on the internet and start shouting about your beautiful home, tell your friends on Facebook, pop some pictures on Pinterest, why not even print some flyers and go door to door delivering them. Give them to friends to distribute, pin them on noticeboards wherever you go, and even put them up in the Supermarkets. You never know where that buyer will be!